After finishing 18 cloth diapers, I was a bit tired of them -- the repetition gets boring after a while. 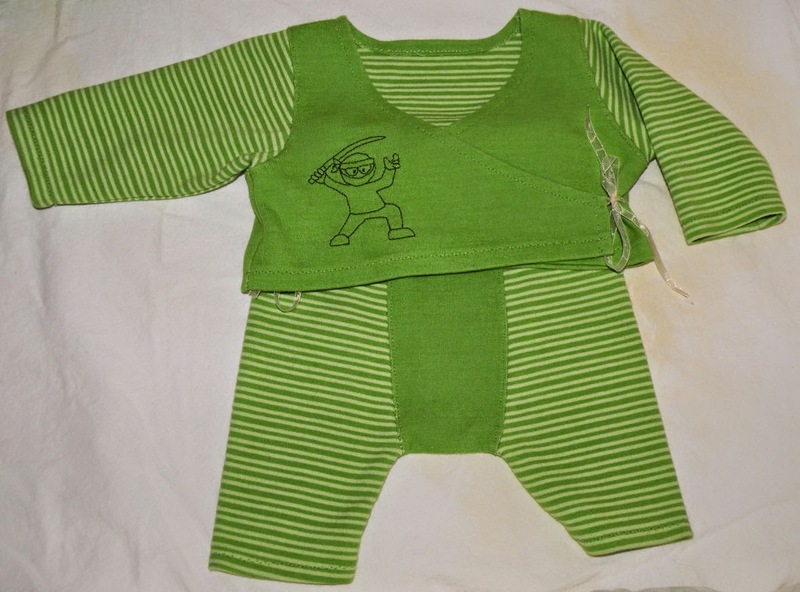 I wanted to sew something else, so I traced off Ottobre 1/2009 numbers 1 and 2, the Nuppu wraparound jacket and Nunnu knit pants. I cut them out of cheerful green double knit I got a Hancock Fabrics a few months ago. I used size 50 (the smallest size) and the finished product is comparable to the 0-3 month store-bought outfits we've been given. I couldn't decide which pieces I wanted to be stripes and which solid, so I enlisted Hubby's help. Turns out he had very strong opinions about which parts should be which, so it's a good thing I asked! 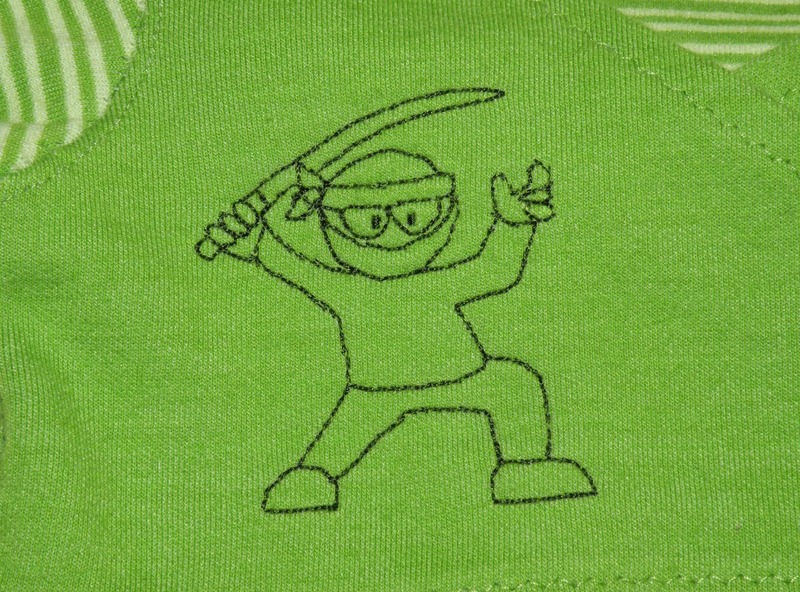 He was also quite adamant about wanting a ninja embroidered on the front (once I shot down the Gears of War logo and Batman symbol). This little guy from How to Draw a Cartoon Ninja fit the bill nicely. I got an awful kink in my neck while working on it, but I'm pleased with the end result. I sewed it with the triple stretch stitch on my sewing machine...no walking foot or anything, just the regular ol' foot and lots of patience. This was the perfect opportunity to try out my new double needle (I finally remembered to buy one the last time I was at JoAnn! ), but I only had a teeny tiny bit of green thread left...not enough for two needles! So I did all the hemming with a small zig zag instead. Yesterday I finished three diaper covers, two fleece and one from a felted sweater to go with my diaper stash. I used Katrina's Quick Sew Soaker Pattern. The preemie size seemed most appropriate for my newborn sized diapers, but I plan to make some of the newborn ones too, just in case. 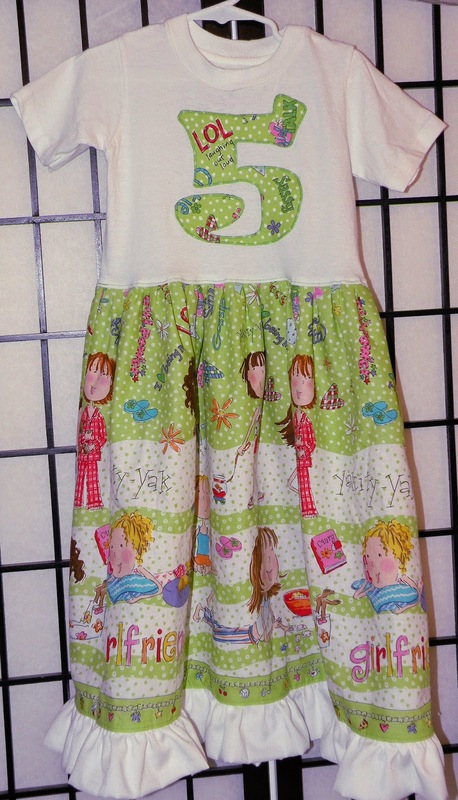 Almost two weeks ago a friend of mine was here for a visit and mentioned that she wanted to applique a number 5 to a t-shirt for her daughter's fifth birthday. I decided to undertake the task myself, only I decided to do a whole dress instead. My mom had given me this very girly fabric and it was perfect for this project! It was a big hit with the birthday girl! Hello, just wanted to thank you for the link to the Ottobre English yahoo group that you posted in the Births.com.au forum.